0% Introductory APR for 15 months for each balance transfer made within 45 days of account opening. After that, a variable APR will apply, 16.24% or 27.24% based on your creditworthiness. 1 Offer subject to credit approval. Not everyone will qualify for the Barnes & Noble Mastercard. If at the time of your application you do not meet the credit criteria previously established for this offer, or the income you report is insufficient based on your obligations, we may not be able to open an account for you. This offer is available to new cardmembers only. For information about rates, fees, other costs, the reward program rules and benefits associated with the use of the credit card program, please see Terms and Conditions . Annual Fee: $0. 0% introductory APR on balance transfers made within 45 days of account opening is applicable for the first 15 billing cycles that immediately follow each balance transfer made within the first 45 days (the "Introductory Period"). For purchases, and for balance transfers after the introductory period, the variable APR is 16.24% or 27.24%, depending upon our review of your application and your credit history at account opening. The variable APR for cash advances is 27.49%. The APRs on your account will vary with the market based on the Prime Rate and are subject to change. For more information see the "About the Variable APRs on Your Account" section of the Terms and Conditions. The minimum monthly interest charge will be $0.50. Balance transfer fee: 3% (min. $5). Cash advance fee: 5% (min. $10). Foreign transaction fee: 3%. The fee for the purchase of cash equivalent transactions (purchase of money orders, traveler's checks, foreign currency, lottery tickets, gambling chips or wire transfer): 5% (min. $10). See Terms and Conditions for information about the terms of this offer. 2 Please review the Rewards Summary for important information about the program benefits and features listed above and the Terms and Conditions for full details about the rewards benefits (such as how points or miles are earned), interest rates and account fees and terms for this particular offer before applying. First Purchase Bonus: After you use your Barnes & Noble Mastercard to make a purchase for the first time, a twenty-five dollar ($25) Barnes & Noble Gift Card will be automatically sent to the mailing address on file for your Barnes & Noble Mastercard. Your first credit card purchase must not be invalidated for any reason. Please allow up to 4 weeks for delivery of the gift card. 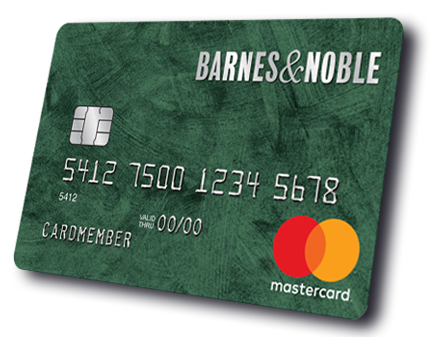 When you use your Barnes & Noble Mastercard to make any purchase online at bn.com and in any Barnes & Noble Store nationwide, a credit in the value of five percent (5%) of such eligible net purchases will be posted to your Barnes & Noble Mastercard account. The five percent (5%) credit will appear on the same billing statement as the charge for the related eligible purchase. Earning Points: Applicants who are approved for the Barnes & Noble Mastercard will earn two (2) points per dollar ($1) on restaurant purchases as defined by merchant category code (excluding Barnes & Noble Cafe purchases), and one (1) point per dollar ($1) for all other purchases (excluding Barnes & Noble purchases). Individual merchants are responsible for designating their own merchant category codes. After you accumulate 2,500 points, a twenty-five dollar ($25) Barnes & Noble Gift Card will be automatically sent to the mailing address on file within 7 to 14 business days after your billing statement period in which you have earned 2,500 points. Barnes and Noble Membership: As the primary cardmember, you are eligible to earn 12 months of Barnes and Noble Membership in your name on each account anniversary, provided that $7,500 or more in eligible purchases are made with the Card during the credit card account year (each 365 day period prior to the account anniversary date). The following do not count towards the $7,500 purchase spend requirement: balance transfers, cash advances, quasi-cash transactions (transactions in highly liquid assets, e.g., assets that are directly convertible to cash such as, but not limited to, money orders, travelers checks, foreign currency and lottery tickets), purchases made by or for a business or for a business purpose, fees, interest charges, and unauthorized/fraudulent transactions. Barnes & Noble will send you a notification once you have earned this Barnes & Noble Membership benefit, which will outline your membership details. If you do not receive this notification within 2-3 weeks, please contact the customer service phone number on the back of your Card. If you already have a Barnes & Noble Membership at the time you earn this benefit, Barnes & Noble will add an additional 12 months to your existing membership, which will extend the date when your next Barnes & Noble Membership fee will be due. If you do not have an existing Barnes & Noble Membership at that time, you will receive an invitation from Barnes & Noble to create a membership account in order to receive the 12 months of Barnes & Noble Membership you earned. The 12 month Barnes & Noble Membership benefit will not be applied retroactively and a credit will not be provided for any Barnes & Noble Membership fees that you may have previously paid. 3 FICO® is a registered trademark of Fair Isaac Corporation in the United States and other countries. Barclays offers FICO® Score access at its own discretion. FICO® Score access is not a permanent feature of your account and may be removed at any time. To view your FICO® Score, your account with us must be open and active (having activity within the past 150 days). The Barnes & Noble Mastercard is issued by Barclays Bank Delaware (Barclays) pursuant to a license from Mastercard International Incorporated. Mastercard and World Mastercard are registered trademarks, and the circles design is a trademark of Mastercard International Incorporated. As the primary cardmember, you are eligible to earn 12 months of Barnes and Noble Membership in your name provided that $7,500 or more in eligible purchases are made with the Card during the credit card account year (each 365 day period prior to the account anniversary date). The following do not count towards the $7,500 purchase spend requirement: balance transfers, cash advances, quasi-cash transactions (transactions in highly liquid assets, e.g., assets that are directly convertible to cash such as, but not limited to, money orders, travelers checks, foreign currency and lottery tickets), purchases made by or for a business or for a business purpose, fees, interest charges, and unauthorized/fraudulent transactions. Barnes & Noble will send you a notification once you have earned this Barnes & Noble Membership benefit, which will outline your membership details. If you do not receive this notification within 2-3 weeks, please contact the customer service phone number on the back of your Card. If you already have a Barnes & Noble Membership at the time you earn this benefit, Barnes & Noble will add an additional 12 months to your existing membership, which will extend the date when your next Barnes & Noble Membership fee will be due. If you do not have an existing Barnes & Noble Membership at that time, you will receive an invitation from Barnes & Noble to create a membership account in order to receive the 12 months of Barnes & Noble Membership you earned. The 12 month Barnes & Noble Membership benefit will not be applied retroactively and a credit will not be provided for any Barnes & Noble Membership fees that you may have previously paid.